Succulents can be finicky, you are doing great, your plant is looking perfect then suddenly something goes wrong. 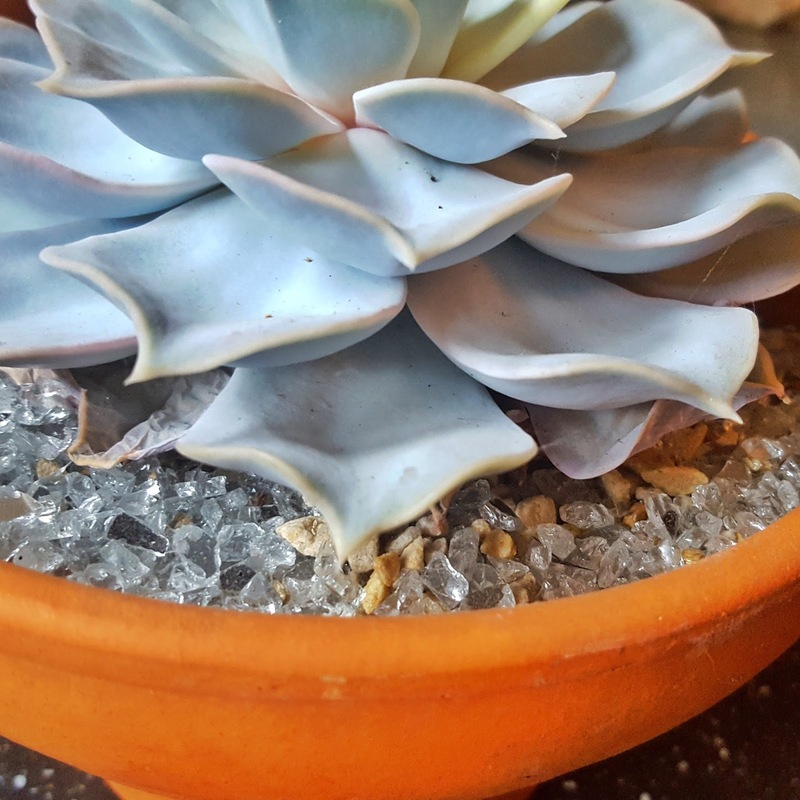 Here's a quick guide to what may be going wrong with your succulent and how you can fix it. Leaves falling off succulent: You gently touch or bump your succulent and the next thing you know half of it's leaves have fallen off. This is a classic early warning sign of over watering. Pull your plant out from the soil and check to make sure it's roots are still healthy. Examine the stem for any black/blue spots. If the roots look healthy pot it up again in dry well draining soil and ease off the watering for a while. If the stem has any black/blue spots that is a sign of rot. Cut your succulent stem above the rot and leave the cutting to callous over for a week. Then you can stick it in some dry soil and it should grow roots again. My succulents leaves are turning yellow and translucent: Again this is a sign of over watering. Pull off any unhealthy leaves and go through the steps above to make sure your plant is healthy. Brown/beige/white marks on leaves: This could be sunburn. Although succulents like sun, midday sun can cause their leaves to burn. This can happen - especially if you are moving plants outdoors after a Winter inside. You should always slowly acclimatise your plants when you are moving them outside, start off with a few hours morning sun then slowly increase the amount of time they are spending in the sunshine. 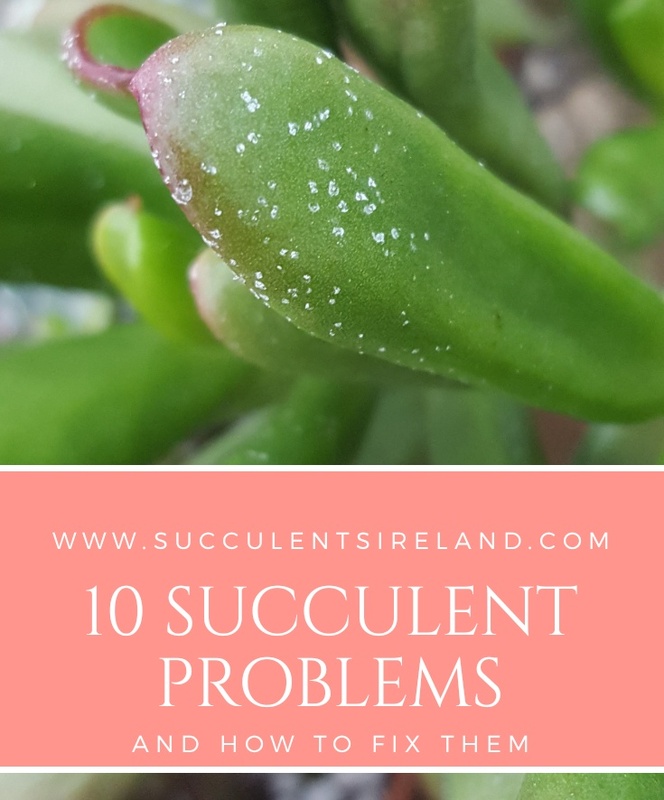 Some succulents are more prone to burning than others so some you will have to keep out of midday sun all the time, if you live somewhere particularly hot you may have to keep most of your succulents out of the afternoon sun. If you have no other option but to keep them in the afternoon sun you can use shade cloth to help diffuse the suns rays. If you grow in a greenhouse you can whitewash the windows to provide shade in the hottest months and simply wash it off come Autumn. There is nothing you can do to heal the leaves that have been burnt on your succulent but over time they will grow out leaving your succulent looking it's best once again. My succulent is leaning to one side: If your succulent isn't getting enough light it may end up growing towards the light and leaning. Find a brighter spot for your plant and rotate to ensure it gets light evenly. 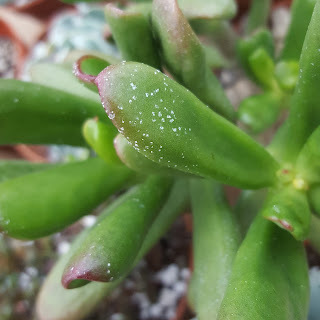 White dots/spots on Jade plants: If these wipe off easily they are probably salt deposits. If you live in a hard water area the minerals from the water will be absorbed by your plant. Your Jade then excretes them through their leaves. This is purely a cosmetic thing and will not harm your Jade. If it bothers you you could try using rain water for watering your plants. 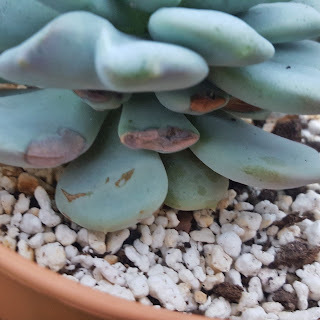 My succulents leaves are wrinkling: This can be caused by lack of water. Give your succulent a deep watering, a little spray of water won't do the trick. My succulent has gone mushy: Your succulent could have gotten too cold and frozen. Once your plant goes mushy there is very little you can do but learn from it and try again. Do make sure you check over the whole plant though, if the stem is still firm you can try taking off all the damaged leaves and seeing if it will grow. 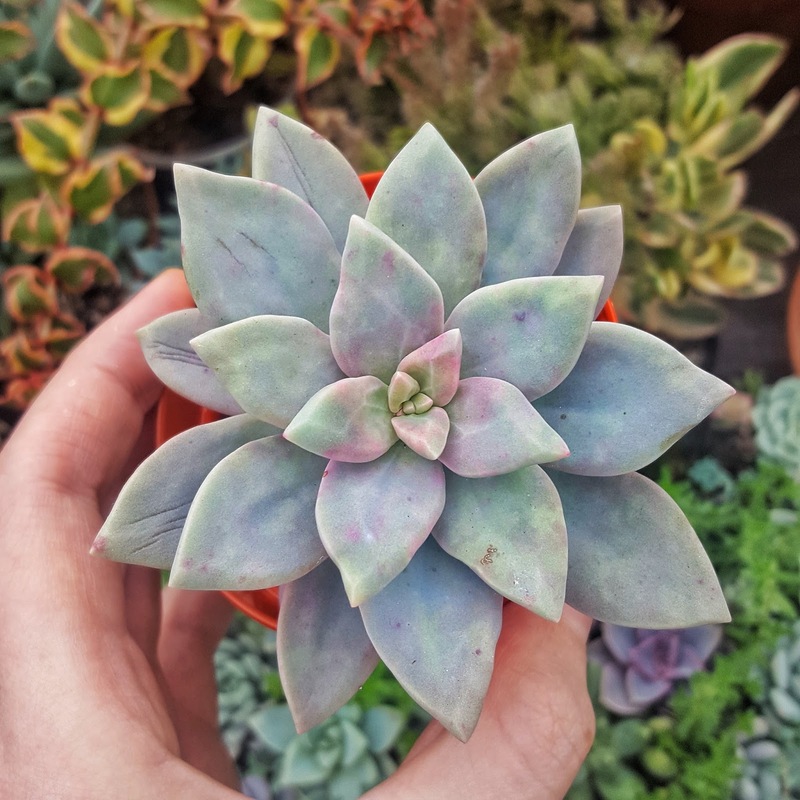 The bottom leaves on my succulent are curling inwards: This can be a sign of lack of light or over watering. 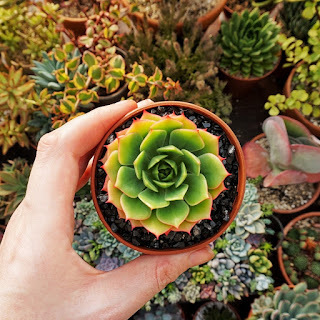 I see this a lot with sempervivums, semps really prefer to be outdoors. It is very hard to meet their requirements indoors. Bottom leaves going brown and crispy: It is perfectly normal for the bottom leaves on your succulent to die as they grow. You can gently pull away the dead leaves to leave your succulent looking fresh. I hope you found this a help in troubleshooting for these common succulent problems. 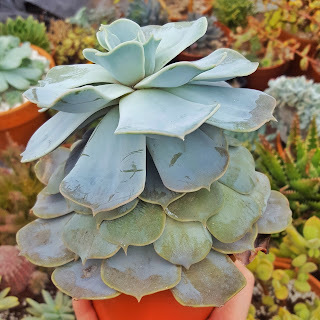 If you have any problems with your succulents that you would like help with please feel free to comment down below or you can email me with your succulent problems(try and include a photo) and I will try to help.